Kaymu.pk Launches Facebook Shops for Its Sellers | ODosta Inc.
Kaymu Pakistan is one the most popular platforms for online shopping. Recently Kaymu has introduced something which has gained a lot of attention, that is, their Facebook shop. Kaymu Pakistan has more than 15000 sellers on its online marketplace. In order to increase the number of orders for the sellers, Kaymu.pk has recently launched its Facebook shop. This Facebook shop is a new feature that will help display the seller’s Kaymu shop on their Facebook page. In simpler words, the sellers can now easily link their Facebook pages with the Kaymu stores, that is, the Kaymu website pages. Whatever the seller is selling on Kaymu, can now easily be displayed on their Facebook page. The basic question that might be asked is that what is the benefit of such a shop? The answer is quite simple, firstly the sellers will have a larger audience to cater to. Nowadays social media platforms like Facebook are very popular. Everyone has a Facebook account which is not only used for communication with friends but also shopping! So when a potential buyer logins their Facebook account and sees that a seller is selling something on Kaymu then they can automatically click on their page and look at the product being sold. This can also be considered as an advertisement for the seller’s products. Many of the buyers might not have the time to go to the website or they might like to browse Facebook. Facebook shops can help the buyers know what is being sold at Kaymu and they can easily get what they want. The new Facebook shop feature is not only beneficial for the sellers but for the buyers as well. The team at Kaymu believes that Facebook is a very widely and accepted medium that will empower the buyers and sellers. Facebook will allow Kaymu to grow as more and more people will reach the website. So many sellers have already started using this Facebook shop which is a good sign that it is definitely helping the sellers. This may also give the buyers to reach out to the sellers and look at their Facebook pages to make their shopping process “secure”. A lot of people in Pakistan get reluctant shopping online because of security issues. So if a buyer sees that a product is linked with a verified Facebook page then they will feel secure and it will give them a guarantee that the products will be authentic. So go ahead folks and avail this new feature and make your online shopping experience even better! 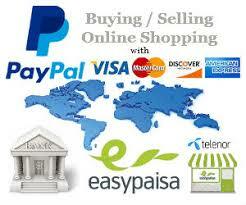 There are many benefits that online shopping will have for you. You can easily get everything delivered at your doorstep anywhere in Pakistan. Kaymu is like your virtual shopping mall which has everything available for you under one roof. You can get all types of products at affordable prices. There are a lot of discounts deals which will make your shopping experience better as the cost of the products will be reduced. Kaymu is a secure online marketplace where hopefully you will have an amazing shopping experience!